Silicon Valley-based View says it cuts energy costs up to 20% with its dimmable glass. Think transition lenses – but for buildings. 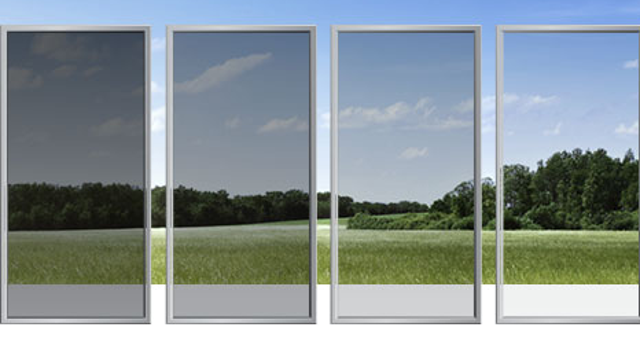 Silicon Valley startup View says dynamic glass that dims based on light, occupancy and weather conditions is the future. The company just closed a fresh $100 million funding round from Madrone Capital Partners. In total, View has raised $300 million from investors including Khosla Ventures, Corning and DBL Investors. The company, which was previously called Soladigm, was founded in 2007. Since 2012, View has installed its high-tech glass in more than 50 projects. CEO Dr. Rao Mulpuri saws the new investment will enable View to accelerate its growth. Dr. Mulpuri says buildings with View glass are able to cut back on lighting costs and HVAC costs by as much as 20% annually. He thinks dynamic glass will eventually become the status quo for architects. But for now, he says the company has found its success with large-scale developers. “In the short- and medium-term, there are certain types of projects where the value is greater than others,” says Dr. Mulpuri, pointing to successful installations at universities, hospitals and hotels. In 2012, View kicked off its partnership with the W Hotel chain, installing View dynamic glass in the San Francisco location’s lobby and lounge areas. While R&D is based in California, View actually manufactures its glass in Olive Branch, Miss., where it employs about 200 workers. Dr. Mulpuri says the location has been a smart choice for the company based on the logistical demands of delivering a delicate product. “Glass doesn’t travel very well … It’s big, it’s bulky, it’s heavy, and logistically you want to be close to the point of use. If you broke a piece of glass, you want to be close enough to be able to transport a replacement fairly quickly,” says Dr. Mulpuri. He says that the company can reach two-thirds of the U.S. market in just 24 hours by truck. The latest investment from Madrone follows closely on the heels of this summer’s $60 million Series E round, led by Corning. While Dr. Mulpuri says an IPO could be in the cards for the company, it won’t be any time soon. “For the time being we’re focused on building the market,” says Dr. Mulpuri. That said, manufacturing intelligent glass in the U.S. doesn’t come cheap. “As we grow, we’ll have to build more and more plants like we have in Mississippi … an IPO is certainly one avenue to raise more capital,” says Dr. Mulpuri. And though Madrone Capital Partners is the investment firm affiliated with the Walton family, it doesn’t sound like Wal-Mart will be the next big customer for the startup. “You might see View’s glass in a Wal-Mart, but that’s not related to Madrone making the investment in the company. It is an independent investment arm – that doesn’t automatically mean that this is linked to Wal-Mart as a corporation,” says Dr. Mulpuri.